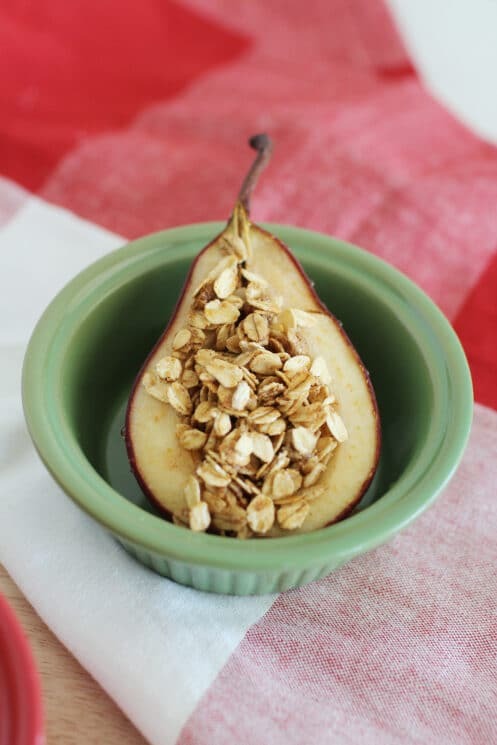 Individual Pear Crisps are a simple dessert with a yummy cinnamon oat filling perfect for kids to have their own! Slice pears in half down the middle. (This saves you time from slicing!) You won’t need to peel the pears – pear skin is thin and can be eaten right along with the middle. It just adds fiber and nutrients! Hollow out the core from the pears. Mix oats, butter, brown sugar and cinnamon together. There is not enough butter to make it sticky, but it is sufficient for baking. 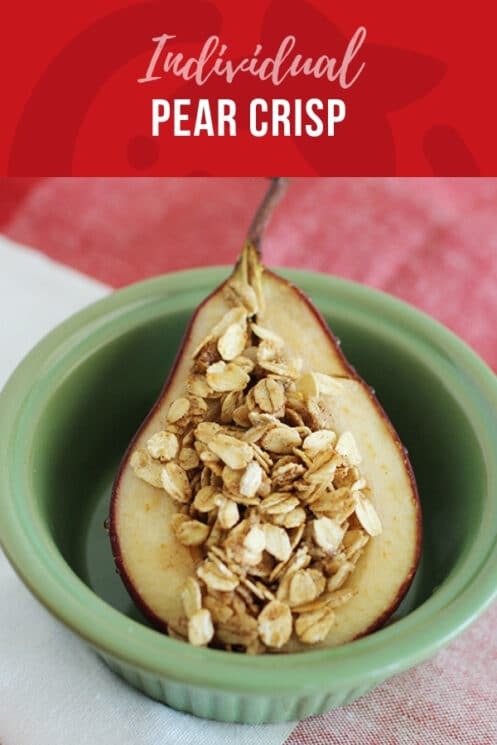 Pour the oat mixture into the cored pears. 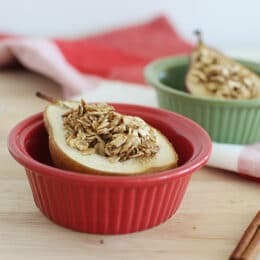 Place pears in a baking dish and Bake at 350 for at least 25 minutes, or until fruit is tender. Make sure your pears are ripe. If they are under-ripe they won’t taste very sweet, and if they are overripe, they will turn out very mushy. You can use pretty much any pear variety. We have tried it with different varieties and they all turn out great. Bake in ramekins! 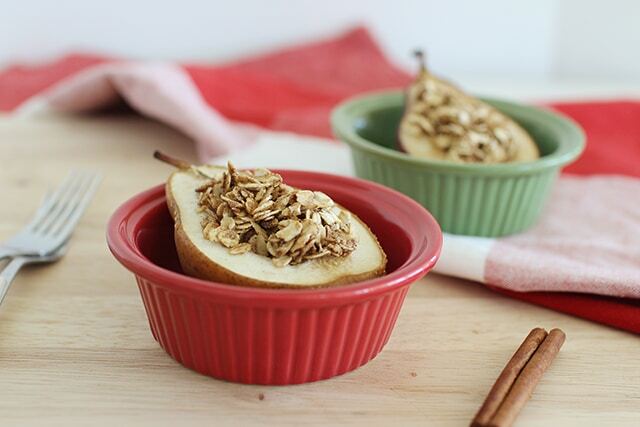 This way you can serve your individual pears right in the dish you used to bake them in. Preheat oven to 350 degrees F. Spray a baking sheet with cooking spray. Cut each pear in half, down the center. Carve out the core area, forming a small hole. Place pear halves open side up, onto prepared baking sheet. Melt butter and then add to a mixing bowl with oats, brown sugar, cinnamon, vanilla and salt. Mix together until crumbly. Scoop an even amount into each pear. Bake for 20-25 minutes, allowing pears to become tender. Wow, I wish I could see his presentation – sounds cool! My pediatrician’s office has all female doctors and all male nurses – how funny is that? I think your piggy pear looks great! Amy, I would try but I’m hooked on the Good Day Pear Crisp you had last year.